Click image to enlarge Klickitat River, Washington, looking upstream. Klickitat River, Washington, looking upstream, as seen from Washington State Highway 14 bridge at its confluence with the Columbia. Image taken November 11, 2004. The Klickitat River is located on the east slope of the Cascade Range in south-central Washington and drains 1,350 square miles. The Klickitat is one of the longest undammed rivers in the northwest, entering the Columbia River at River Mile (RM) 180.5. The Washington community of Lyle sits on the Klickitat's left bank at its junction with the Columbia. Upstream are the basalts of the Rowena Gap and downstream are Chamberlain Lake, Catherine Creek, Major Creek, Rowland Lake, and the basalts of the Bingen Gap. The White Salmon River lies 12 miles downstream. 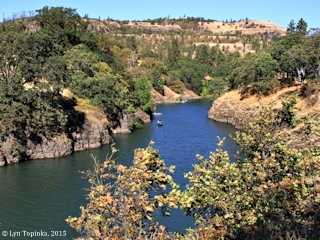 Across from the Klickitat River is Oregon's Mayer State Park. 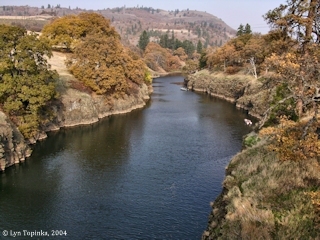 In 1986 the lower 10 miles of the Klickitat River were designated recreational under the Wild and Scenic Rivers Act, an Act created to preserve in a free-flowing condition selected rivers of the nation which "with their immediate environments, possess outstandingly remarkable scenic, recreational, geologic, fish and wildlife, historic, cultural, or other similar values". According to the Columbia Basin Fish and Wildlife Authority website (2004), the mainstem Klickitat River arises from the Cascades below Cispus Pass at approximately 5,000 feet elevation and flows 95 miles to its confluence with the Columbia River and the reservoir behind the Bonneville Dam. Major tributaries to the mainstem Klickitat include Swale Creek, Little Klickitat River, Outlet Creek, Big Muddy Creek, West Fork Klickitat River, and Diamond Fork. The geology of the Klickitat drainage is dominated by extensive basalt strata having a total thickness of several thousand feet. Volcanic rocks of four distinct age groups underlie the basin. The Cascade crest is dominated by Mount Adams, a 12,000-foot dormant volcano with an extensive glacier system that drains into the Klickitat River. At the northwest corner of the basin lie the Goat Rocks, the deeply eroded remnants of an extinct volcano, that reach to about 8,000 feet. The northern boundary is the Klickton Divide, a 7,000-foot ridge of Columbia River Basalt that separates the Klickitat from the watershed of the Tieton River, a tributary to the Yakima. The Lost Horse and Lincoln plateaus, 5,000 to 6,000-foot-high plateaus underlain by Columbia River basalts, separate the Klickitat from the Ahtanum and Toppenish basins, which drain east to the Yakima River. In the southeast part of the basin, younger volcanic rocks, including many cinder cones, cover the older basalts on the divide separating the Klickitat from the Satus Basin. Click image to enlarge Klickitat River drainage, as seen from Rowena Crest, Oregon. The Washington community of Lyle is located on the Klickitat's left bank. Image taken August 23, 2008. 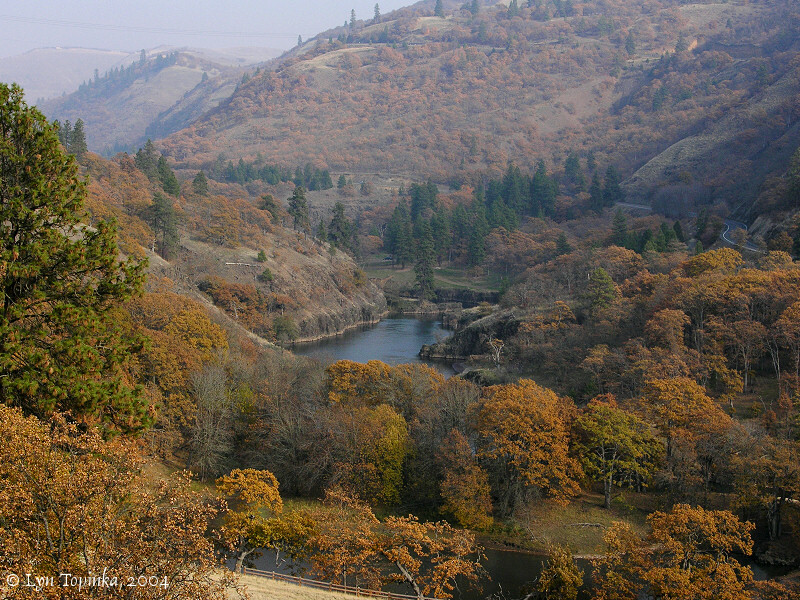 Lewis and Clark passed the mouth of the Klickitat River on October 29, 1805, and named it "Cataract River". On their return, the men passed the Klickitat on April 15, 1806. In 1841, Charles Wilkes of the U.S. Exploring Expedition, had the Klickitat River labeled "Rascals R." on the inset to his "Map of the Oregon Territory". Across from the "Rascals R." was "Upper Cape Horn", today the impressive basalt lava flow of the Rowena Gap. In 1843 Captain J.C. Fremont called today's Klickitat River "Tinanens creek". The Indian village is near the location of today's Lyle, Washington. NOTE: McArthur and McArthur in "Oregon Geographic Names" (2003, Oregon Historical Society), says Fifteenmile Creek, Oregon is "Tinanens Creek". "... This is probably the same stream mentioned by Capt. John Charles Fremont on November 25, 1843, as Tinanens Creek." Fifteenmile Creek however is ABOVE the location of mission at The Dalles, where Fremont was camped, and not BELOW as Fremont writes. Plus, Fremont says the village is AT THE MOUTH of the creek, thereby putting Tinanens creek in Washington State, and Fifteenmile Creek is in Oregon. 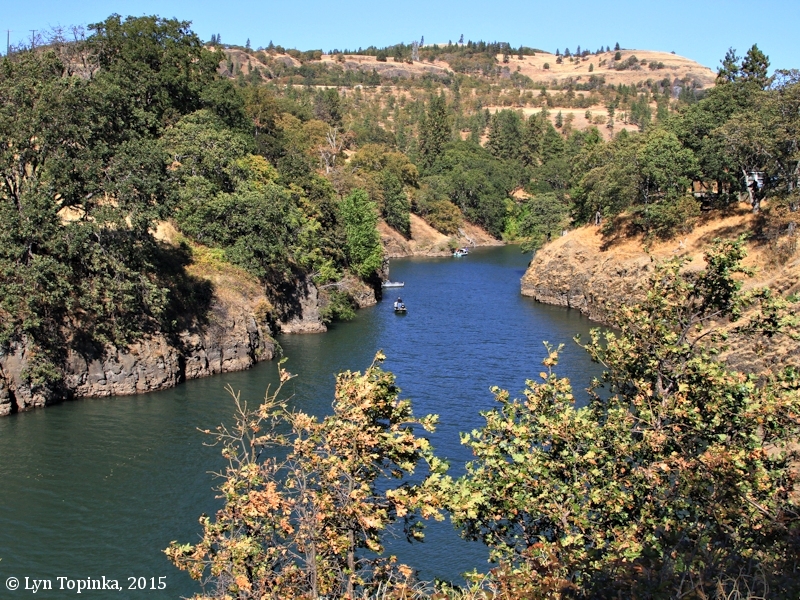 Ten miles below The Dalles on the Washington side of the Columbia lies the Klickitat River. 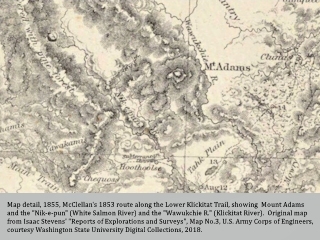 The 1855 Railroad Survey Map conducted by Isaac Stevens shows the upper portion of the Klickitat River labeled "Wawukchie R." and the lower part labeled "Klikatat R.". George McClellan crossed the "Wawukchie R." on August 14, 1853. 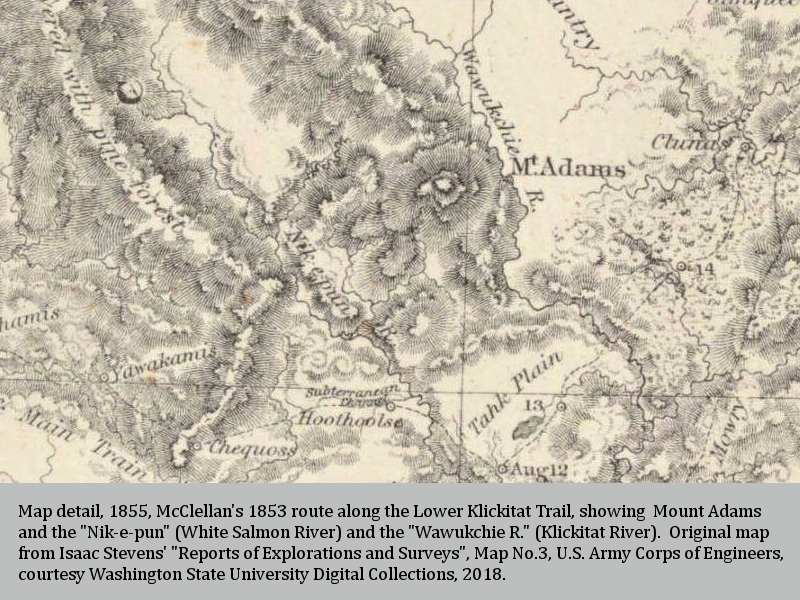 The 1855 "Map of a part of the Territory of Washington : to accompany report of Surveyor General" had the river labeled "Klick-a-tat R."
Click image to enlarge Map detail, 1855, McClellan's 1854 route along the Lower Klickitat Trail. Original map from Isaac Steven's "Reports of Explorations and Surveys ...", 1855, Map No.3, U.S. Army Corps of Engineers, courtesy Washington State University Digital Colletions, 2018. Mount Adams, the "Nik-e-pun" (White Salmon River), and the "Wawukchie R." (Klickitat River). "Hoothootse" is the Trout Lake area and "Tahk Plain" is today's "Camas Prairie". Click image to enlarge Klickitat River, Washington, looking upstream. View from trailhead, left bank, upstream from mouth. Image taken September 26, 2015. Click image to enlarge Klickitat River, Washington, looking downstream. View from trailhead, left bank, upstream from mouth, showing the "Twin Bridges". Image taken September 26, 2015. 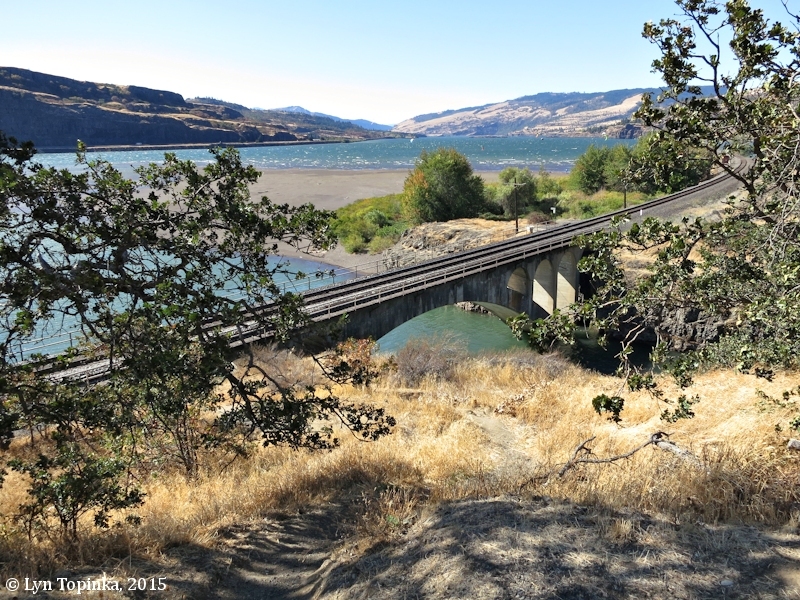 Lyle, Washington, is located on the north bank of the Columbia River at River Mile (RM) 181, where the Klickitat River merges with the Columbia. Immediately across from Lyle is Mayer State Park and Rowena Crest, Oregon. 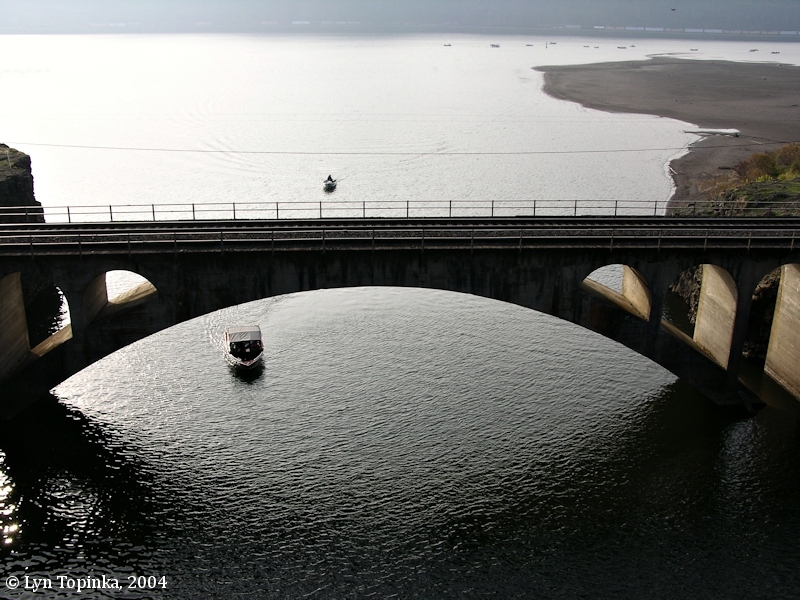 Two bridges, locally known as the "Twin Bridges", cross the mouth of the Klickitat River at Lyle, Washington. 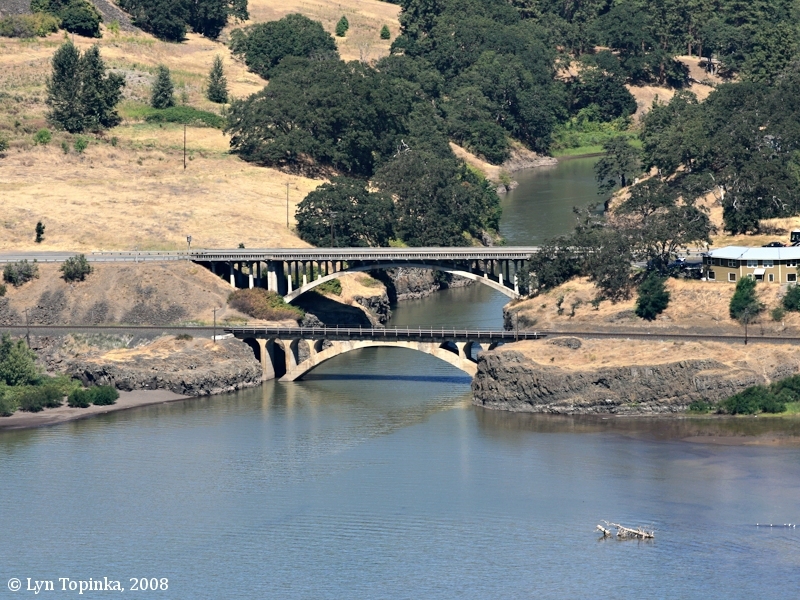 The lower railroad bridge was built in 1908 and the upper Highway 14 bridge was built in 1933. 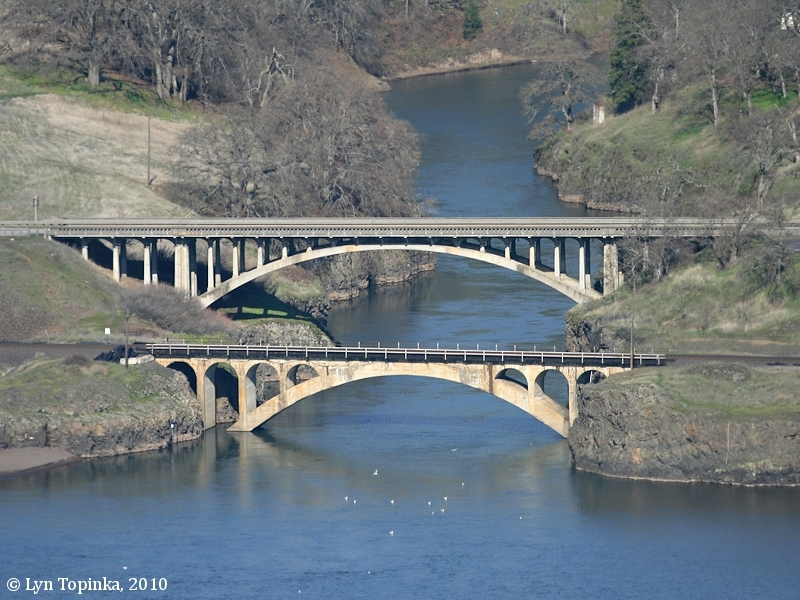 Both are concrete open-spandrel arch bridges. Klickitat River Railroad Bridge: The Klickitat River Railroad Bridge crossing the Klickitat River just west of Lyle was built in 1908 by the Contracting and Engineering Company of Tacoma as part of the Spokane, Portland, and Seattle Railway. The bridge is 200-feet long and has a 160-foot-long concrete arch. It was listed on the Washington Heritage Register in March 1981. Klickitat River Washington State Highway 14 Bridge: The 265-foot-long concrete arch bridge carries Washington State Highway 14 traffic across the Klickitat River. The arch span is 160 feet. The bridge was built in 1933. Click image to enlarge Klickitat River and the "twin bridges", as seen from Rowena Crest, Oregon. Image taken August 23, 2008. Click image to enlarge Klickitat River and the "twin bridges", as seen from Rowena Crest, Oregon. Image taken March 6, 2010. 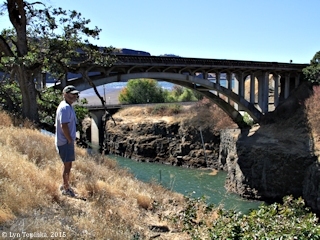 Click image to enlarge Klickitat River, Washington, looking downstream at railroad bridge. Klickitat River, Washington, looking downstream, as seen from Washington State Highway 14 bridge at its confluence with the Columbia. Image taken November 11, 2004. 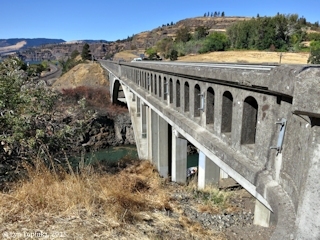 Click image to enlarge North side, Highway 14 bridge, Klickitat River, Washington, looking west. View left bank, upstream from mouth. Image taken September 26, 2015. 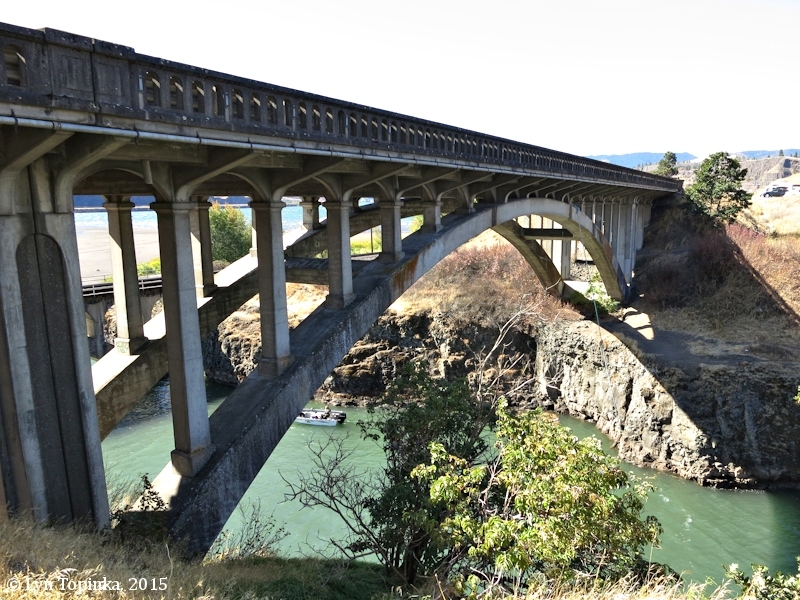 Click image to enlarge South side, Highway 14 bridge, Klickitat River, Washington, looking west. View left bank, upstream from mouth. Image taken September 26, 2015. Click image to enlarge Railroad bridge, Klickitat River, Washington, looking west. View left bank, upstream from mouth. Image taken September 26, 2015. Designated Reach (November 1986): From the confluence with Wheeler Creek, near the town of Pitt, to the confuence with the Columbia River, total 10.8 miles (U.S. Forest Service website, 2015). 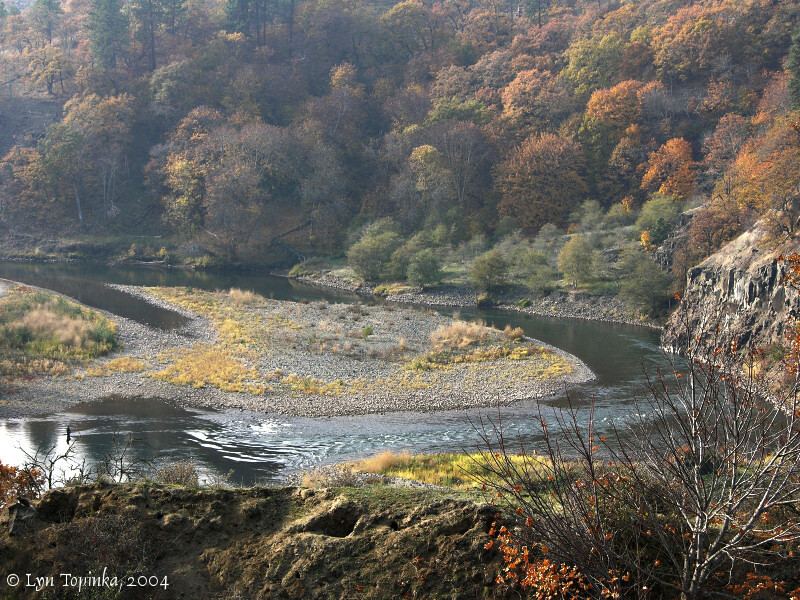 Click image to enlarge RM 1.0 ... Klickitat River Valley, looking upstream. Klickitat River Valley, Washington, as seen from the right bank, approximately one mile upstream from its confluence with the Columbia. Image taken November 11, 2004. Click image to enlarge RM 1.0 ... Klickitat River, Washington, upstream one mile. Klickitat River, Washington, looking downstream, as seen from the left bank, upstream one mile from the mouth of the river. Image taken November 11, 2004. The Washington State Highway 142 Klickitat River Bridge (also known as Bridge Number 142/9) is located near Klickitat River Mile (RM) 18, approximately five miles upstream of the town of Klickitat and two miles downstream from the junction of the Little Klickitat River with the Klickitat. Highway 142 connects the two Washington communities of Lyle and Goldendale. According to the Washington State Department of Archaeology and Historic Preservation website (2006) the Klickitat River Bridge was designed in part by Harry R. Powell and Leonard K. Narod and was completed in 1954. The Klickitat River Bridge replaced an old timber truss bridge that had crossed the river at the same location. The new bridge, a pre-stressed concrete structure, was 141 feet and 8 inches long and used the concrete supports of the old bridge. Pre-stressed concrete bridges were developed in France and had been in use in Europe since the mid 1940s. They came into use in the United States in 1950 due to the steel shortages after World War II. The Klickitat River Bridge became the first of its kind in the State of Washington. In 2002 the Klickitat River Bridge was added to the National Register of Historic Places (Structure, #02000242), for its "association with and contribution to the beginning and growth of a vigorous precast pre-stressed concrete industry in the state". Click image to enlarge Penny Postcard: Klickitat River, Washington, with Mount Hood, Oregon, in the background. Penny Postcard, ca.1910. Caption reads "Klickitat River. Mt. Hood in the distance". #6094, The Portland Post Card Col., Portland, Oregon. In the private collection of Lyn Topinka.